Wang Hsu-­sheng is a meticulous craftsman, one whose every action, whether placing window frames and tiles within his architectural creations or crafting facial hair for his human figures, is guided by the care, knowledge and experience of a third-generation papier mâché master. Wang believes that “lifelike” papier mâché can transcend mere craft and become art, and that would-be papier mâché artists must, at the very least, have a good eye, a perceptive mind, and patience. While that may not sound like much in principle, this folk art is far from simple in practice. China began developing uses for paper soon after its Han-Dynasty invention, traditionally attributed to Cai Lun. 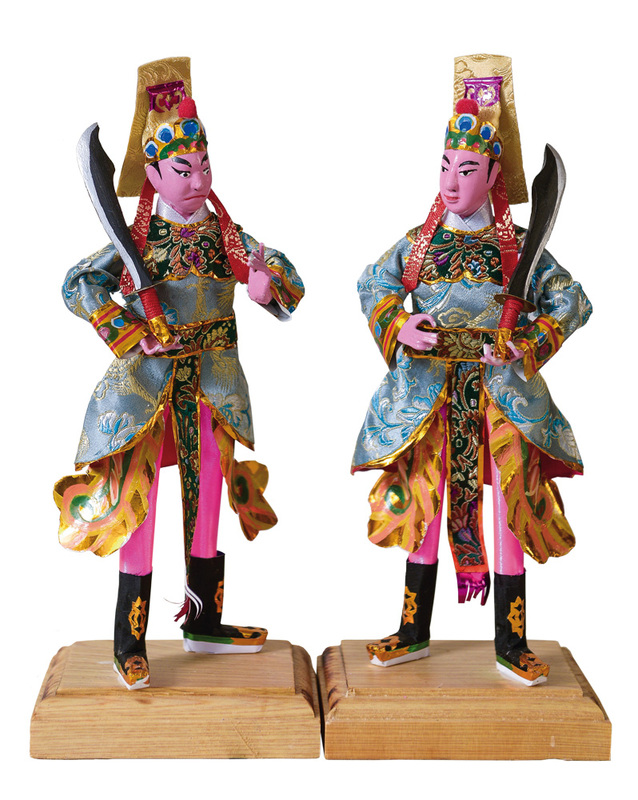 Papier mâché artisans credit the Emperor Tai­zong with creating both paper money and papier mâché during his Tang-Dynasty reign. In spite of its lofty origins, papier mâché, known as hu­zhi in Taiwan and ­zhiza in mainland China, is a folk handicraft with deep connections to folk culture. Legend says that on one occasion Emperor Tai­zong fell into a deep sleep, during which his spirit traveled to the under­world. Moved to compassion by the sight of the lonely, wandering ghosts, he resolved to give them a warehouse full of gold. On returning to the living world, the emperor fulfilled his promise by ordering that “ghost money” be burned on behalf of the dead, and that additional offerings be crafted for them by pasting paper atop bamboo frames. 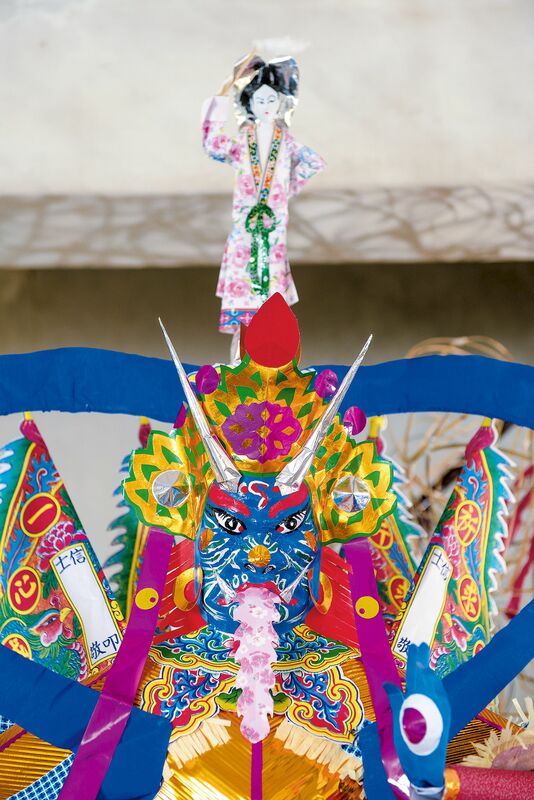 Although papier mâché has its roots in these ceremonies for the dead, this bamboo-and-paper art slowly extended into other areas, with some of its techniques being applied to create objects used in folk festivals and everyday life, everything from paper lanterns and kites to brilliant ceremonial gateways and even plaques. 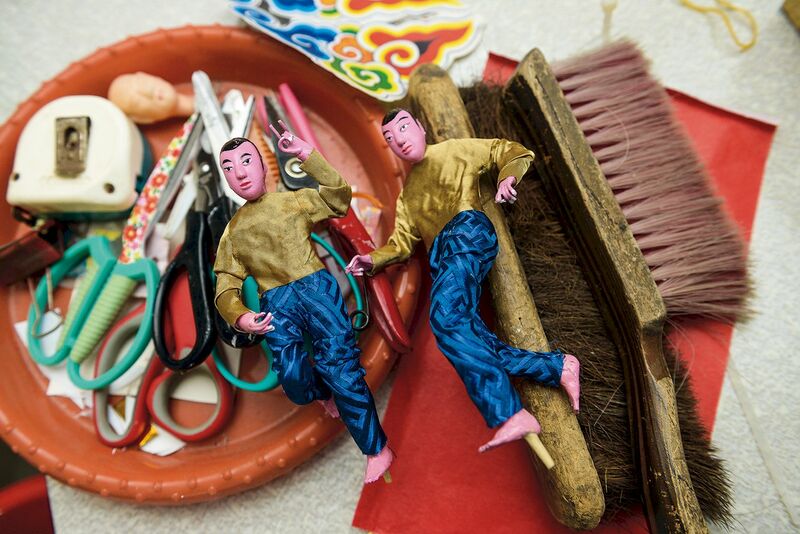 The Wang family of Ma­gong, ­Penghu, have been papier mâché artisans for three generations. Their craftwork began with Wang Yu, who passed his knowledge on to his son Wang Zong­tian, who in turn passed it on to his own children, including Wang Hsu-­sheng. Zong­tian and his wife had five children, four boys and one girl. Like their father before them, the kids began studying papier mâché while still quite young. In those days, Daoist folk religion was still supported by the faith of ordinary people. Daoist temples required large numbers of papier-mâché objects for the rituals associated with seasonal festivals and other customs, and they would typically place their orders with artisans three to six months in advance. When Zongtian received such a commission, he would choose a son to help with the work, then sequester himself and that son in the temple until the project was complete. Wang also frequently makes use of ordinary wood-free paper, poster paper, and foil. The only paper he doesn’t use is newsprint, out of respect for the text printed on it. Wang thinks papier mâché made with only a single type of paper looks bland. Noting that artisans sometimes need to work with fabrics and sequins, he says they should be able to sew and weave as well as carpenter and paint. Though the field is closely connected to Daoist and funerary rituals, the Wang family have long made papier mâché for all occasions, everything from weddings to funerals. Wang says that in the old days, wealthy individuals often used to hire papier mâché artisans to sculpt personages associated with good fortune, the kind of historical or mythical figures that you’d typically find carved into a temple wall. But changing times brought on a rapid contraction in the papier mâché market. Nowadays, the bulk of Wang Hsu-­sheng’s work consists of making ritual objects for Daoist ceremonies. Wang says that papier mâché figures of the “three officials,” those of the air, earth and water, are common during offerings at Daoist temples. He notes further that the mounts of the “four great marshals”—a tiger, a leopard, a lion, and an elephant—are often used to protect offering places, and that a papier-mâché Pudu Gong (“the lord of crossing over”), who manifests with a small Guan­yin figure standing on his head, is obligatory as well. Since ceremonies usually exist to ward off calamities or evil, or help people through crises, they often include papier-mâché depictions of the types of misfortunes they are intended to ward against, such as those involving children, Tai Sui (the god of the year), funerals, or accidental injury. By burning the symbol of a potential misfortune, the ceremony protects against its occurrence. The funeral ritual known colloquially as the “rite of merit” is conducted to help departed souls be reborn. It uses a papier mâché edifice (representing the Fortress of the Unjustly Dead), a gold mountain, a silver mountain, a “clothes changing mountain” (which provides the soul with a place to get properly dressed and made up), and a zhuang (a ritual vessel that guides the soul to Hell). The type of zhuang is related to the manner of the soul’s passing. For example, a “water zhuang” is used for persons who drowned, while a “blood zhuang” is used for those who were murdered. 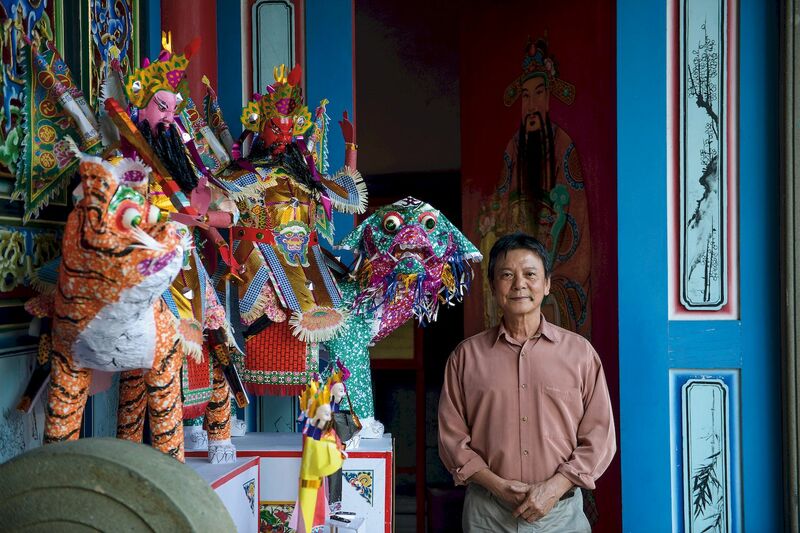 Wang Hsu-­sheng says that a month-long Daoist ceremony makes use of roughly 200 to 300 papier mâché objects. 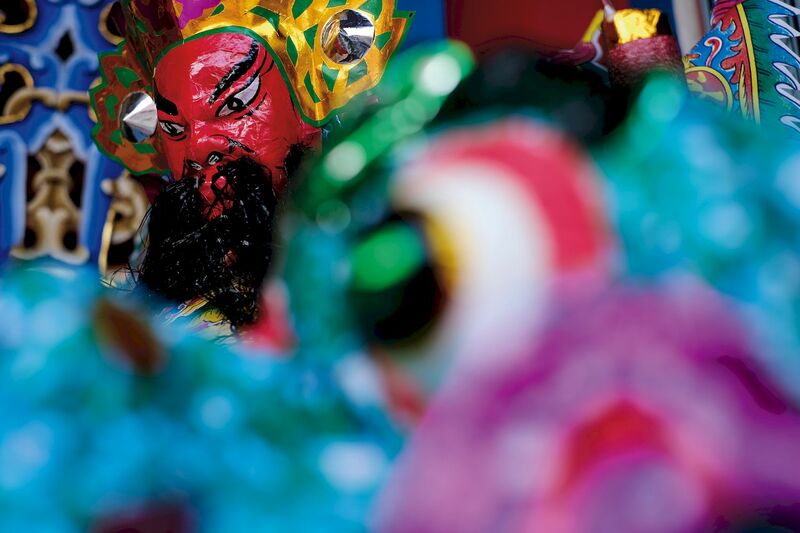 Back in the industry’s heyday, the Wang family produced every papier mâché object used in Xiyu Township’s pudu ceremony, which involves making ritual offerings to the dead, and is held in the seventh lunar month (known as Ghost Month in Taiwan). As the current head of the family’s papier mâché business, Wang is keenly aware of the impact of changes to funerary customs on the industry. Wang says that the rise of funeral homes three or four decades ago triggered a major transformation in Taiwan’s funeral customs. “In the past, the family of the deceased would spend three years in mourning before finally burning the papier-mâché objects produced for the funeral ceremonies. Now, mourning ends with the funeral procession. 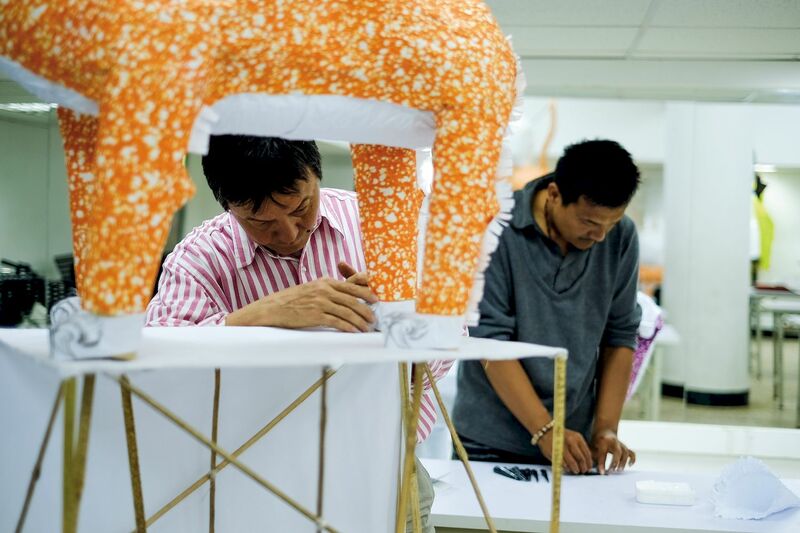 Everyone takes off their mourning garb and that’s the end of it,” says Wang, who has personally witnessed the transformation in Taiwanese funeral traditions and the concurrent rise and fall of Taiwanese papier mâché handicrafts. Fortunately, Wang couldn’t bear to see the craft disappear, and remained active in the field. Seeking to stem the loss of traditions, Wang refuses to take projects from the funeral industry or make non-traditional papier mâchés. He says that while artisans nowadays have access to better and more easily worked materials than they did in the old days, not to mention materials that allow finer work, what they lack are the time and patience to work slowly and meticulously. Some cut corners by attaching strips of black paper below the nose to create “facial hair” on human figures. Wang says this kind of “hair” looks like nothing more than a bit of black paper. He rejects this modern convention, instead using cotton thread or hemp rope fiber, as they did on the old days, or even plastic rope fibers, to create “hairy” looking facial hair.